We sat out the 3 games on Super Bowl Sunday after enjoying a 7-4 day on Saturday. What a crazy football game that was last night! Full credit to the Patriots for scoring two touchdowns and two 2-point conversions in the final 6 minutes of the fourth quarter just to force overtime. But Atlanta has to be kicking itself for not putting the game away when it had the chance, especially when they were in field goal range with 4 minutes to go in the fourth quarter and could have gone up 2 scores before bumbling their way out of field goal range with a sack and a holding penalty. There are 3 NHL games scheduled for tonight, all of them early starts. 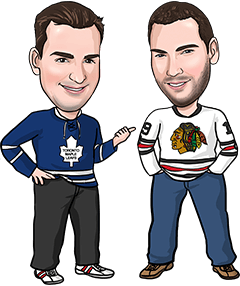 Our favourite bet of the day comes in Leafs/Islanders, plus we’ve got stats, trends and opinions on the other 2 games as well. See you tomorrow to break down the 11-game Tuesday board. Good luck! We’re always very reluctant to bet Over 5.5 because it often requires both teams to score 3 goals to cash your bet, but we love the potential for both teams to get 3+ tonight. The Leafs have given up 5 goals in 3 consecutive games and are playing their sixth straight road game (fourth since the all-star break), not the best situational spot for them to turn their defensive play around. Meanwhile, the Islanders have scored 3+ goals in 5 straight games and 9 of their last 10. We actually wanted to take the New York team total Over 2.5 here instead of the full-game over, but the odds jumped from -136 to -145 on that before we could bet it. Fortunately, the Leafs can contribute some goals towards this total as well. They’re coming off a 6-goal performance Saturday in Boston, the 5th time in 10 games they’ve scored 4 goals or more. And the Islanders’ play in their own end has fallen off a bit in the last couple of outings, giving up 5 in each of their last 2 games after allowing a total of 9 regulation time goals in their previous 7. The odds on this game (close to a pick ’em) also suggest that the Leafs will give New York all it can handle, so if we like the chances of the Isles getting 3 goals or more, the Leafs would have to score a few to keep things close. There’s a history of higher-scoring games between these teams (8-2 to the Over in the last 10 meetings in New York; 35-17-2 last 54 meetings), and we’ll look for another one tonight. Reasons to bet Buffalo: The Sabres are coming off a 4-0 win over Ottawa on Saturday and are 4-2-1 in their last 7 games. New Jersey has lost 7 straight games at home (0-5-2). Reasons to bet New Jersey: The Devils are 6-3-1 in their last 10, including a 5-1 win Saturday in Columbus. Buffalo has lost 7 of the last 8 meetings. Reasons to bet St. Louis: The Blues have won 3 of their last 5 road games, including victories in San Jose, Anaheim and Pittsburgh. Philadelphia has scored 2 regulation time goals or less in 7 of its last 8 games, and in 8 straight if you exclude empty netters. Reasons to bet Philadelphia: The Flyers have allowed just 9 regulation time goals in their last 6 games. St. Louis has lost 5 of its last 6 trips to Philadelphia.